The TSACO-2000 is a transport stream automatic failover switch and transport stream format converter all in one. The TSACO-2000 is compliant with both ATSC and DVB standards and is ATSC Mobile DTV Ready. 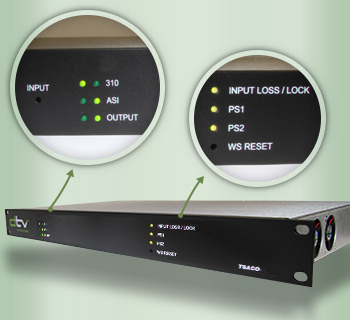 The TSACO-2000 enables broadcasters to automatically switch between a primary and backup transport streams in the event of a failure preventing broadcasters from unexpectedly going off air as defined in the user configurable web interface. It also converts transport streams between ASI and SMPTE 310M formats. It accepts both formats in and will output both formats simultaneously. It is controlled via a web server user interface and allows the user to configure trigger thresholds and monitor the unit status. Adhering to the concept of our TSACO family of products, the TSACO-2000 is designed for easy operation. The TSACO-2000 has GPI/O, dual power supplies for reliability and is field upgradable.